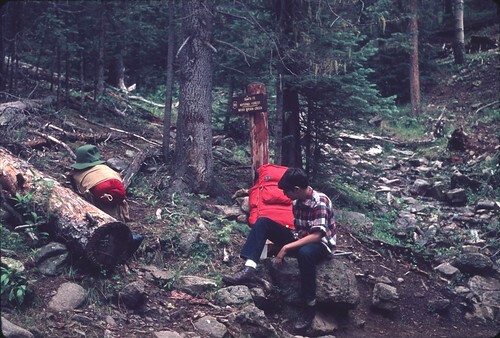 In the summer of 1971, my dad and I headed out on our first wilderness backpacking trip in the Pecos Wilderness. The first person we met on the trail was from our home town, Baton Rouge! Of course, we asked him how far it was to our destination, Beatty’s Cabin. He told us, but he added a bit of wisdom. When he went backpacking in the wilderness, he didn’t worry too much about specific spots. His destination was the wilderness, and he was already there. I still remember that—as soon as I leave the trailhead, I’m already there. This was our first stop on the trail that year, before the meeting. And yes, it was at Noisy Brook Creek, an odd name. And, if you are still thinking about destinations, this is our tent, a Gerry Year-Round, set up in the meadow at Beatty’s Cabin. I believe this area has been closed to camping due to overuse for a few decades now. I scanned these photos from my dad’s slides. 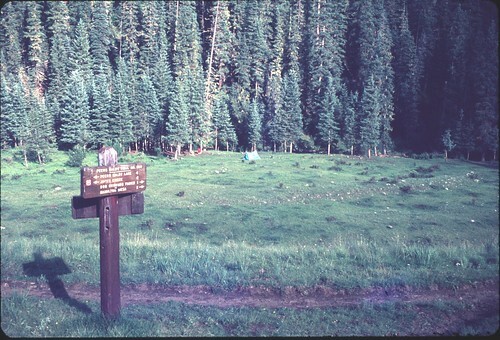 This entry was posted in Backpacking & Hiking and tagged Pecos Wilderness. Bookmark the permalink.